In mixed smallholder systems, which integrate crop growing with livestock raising and which are ubiquitous throughout the developing world, livestock are often kept not only to produce milk or meat, but also to produce manure for fertilizing croplands, to pull ploughs and are also considered as major capital assets. Thus, in contrast to industrialized countries, where livestock are produced in ‘industrial’ production systems for single products (e.g. beef, milk, chicken or pork meat), farm animals in such smallholder settings are predominantly ‘multi-functional’. We know that livestock production, particularly of ruminant animals, generates significant amounts of greenhouse gases (GHGs), which are causing global warming. Many research groups are intensely studying these livestock emissions, to find ways to reduce them. However, the multi-functionality of small-scale livestock systems in developing countries presents a challenge when it comes to assessing the levels of GHGs emitted by these smallholder systems. A team of scientists from Wageningen University and the International Livestock Research Institute (ILRI) set out to redress this. In a paper published in June 2014, the authors explore how to account for multi-functionality within the life cycle assessment (LCA) method to assess the contribution of livestock production to greenhouse gas (GHG) emissions. The study which was carried out in a smallholder dairy setup of Kaptumo area, Rift Valley, Kenya was premised on the backdrop that most LCA studies allocate GHG emissions of livestock marketable outputs only, while in smallholder systems as mentioned, livestock provide several products and services besides the marketable products. The study argues that in assessing the carbon footprints of mixed smallholder dairying, farmers’ perspectives on cattle and their functions should always be taken into account. The authors establish that “farmers’ motives for cattle keeping are manifold, thus the total value of cattle is comprised of a complex combination of functions rather than a single function”. The authors then show that carbon footprint estimates of milk production are strongly influenced by the inclusion or exclusion of the multiple functions of cattle, and this subsequently influences conclusions about mitigation of climate change. The authors conclude that considerations of climate change mitigation options must take note of differences in farmer contexts. In the article, it is highlighted that “GHG mitigation options must be discussed in face of farmers’ complex and diverse economic opportunities, objectives and constraints”. The authors argue that the most appropriate GHG mitigation options may not necessarily be within the dairy component and hence the need to assess the whole farm. The study recommends that “assessment of smallholder systems should account for multi-functionality, because carbon footprints results to change depending on the function included”. LCAs are the standard methods used to assess the contributions livestock production makes to GHGs. 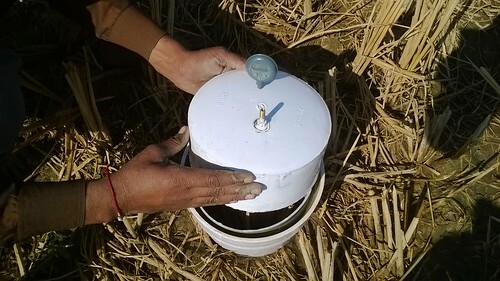 In this study, it was established that “an LCA methodology that incorporates multiple products and farmers’ valuations of multiple cattle functions is more capable of accurately characterizing the system, and thus more likely to lead to mitigation options and policy recommendations that are grounded in and effective for the realities of smallholder livelihoods”. In this study, Todd Crane– a climate change adaptation scientist with ILRI collaborated with scientists from Wageningen University. Tags: GHG emissions, Todd Crane, Wageningen University. Bookmark the permalink.